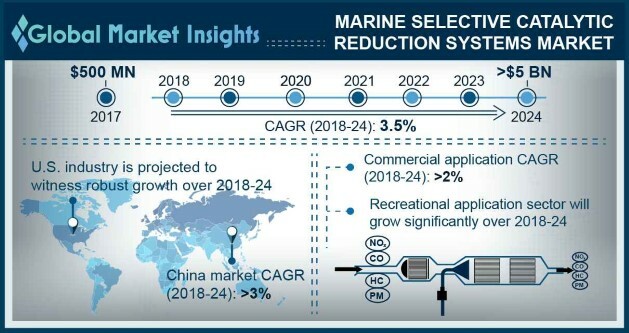 Marine Selective Catalytic Reduction System Market size is set to surpass USD 5 billion by 2024, as reported in the latest study by Global Market Insights, Inc.
Increasing levels of nitrogen emissions from maritime industry along with growing concerns over its adverse effects on human health and environment will drive the marine Selective Catalytic Reduction (SCR) system market growth. The IMO introduced a norm under Regulation 13 with an aim to limit nitrogen emissions by engines with power output more than 130kW. The directive applies to the vessels installed and built from 1st January 2016. Rising concerns pertaining to NOx emissions coupled with stringent legislative norms is anticipated to encourage the product adoption. China marine selective catalytic reduction system market size is predicted to expand over 3% by 2024. Increase in long international voyage coupled with rising inter-border trade, cross-border mergers, and tax inversions will encourage the product adoption. The China Ministry of Transport published new NOx control requirements on 3rd July 2018, that specifically imply to second hand imported & domestic diesel engine vessels. Growing regulatory pressure on ship manufacturers to meet environmental norms coupled with monetary penalties will stimulate the marine selective catalytic reduction system market growth. However, high installation cost and rise in clean fuel adoption may act as a constraint for the product demand. Increasing ocean acidification along with rising legislative pressure with an aim to limit NOx emissions will fuel the Europe marine selective catalytic reduction system market growth. Ongoing R&D investments pertaining to product design and ability to reduce the cost pressure will strengthen the business outlook. In addition, the need for the big ships to report its annual emission data along with other information post 2018 will propel the product installation. Commercial marine selective catalytic reduction system market will grow over 2% by 2024. Growing standards with regard to system operation, inspection, and construction to maintain safe trade will stimulate the product adoption. Rising awareness to minimize maritime pollution coupled with ongoing R&D ventures with an aim to develop emission control technologies will positively impact the industry landscape. Rising disposable income, demographic shifts, and improved standard of living leading to growth in investments toward tourism industry will drive the Asia Pacific marine SCR system market size. In addition, increase in shipbuilding activities, most notably in China, Japan and South Korea is anticipated to encourage the regional industry growth. Ongoing investments to limit pollution by marine industry through establishing new ECA zones will further boost the product adoption. Key manufacturers active in the marine selective catalytic reduction system market comprise Tenneco, Wärtsilä, YARA International, Hyundai, Mitsubishi, Johnson Matthey, PANASIA, Hitachi Zosen, MAN Energy Solutions, Agriemach, Hug Engineering, DCL International, Caterpillar, ECOUREA, ME Production, and DEC Marine amongst others.